Welcome to the official discussion thread for Monster Hunter Generations on the 3DS! To start, please add this game to your log, add it to your collection (if applicable), and (when you are ready) rate it using the link above! MONSTER HUNTER GENERATIONS HAS LANDED! 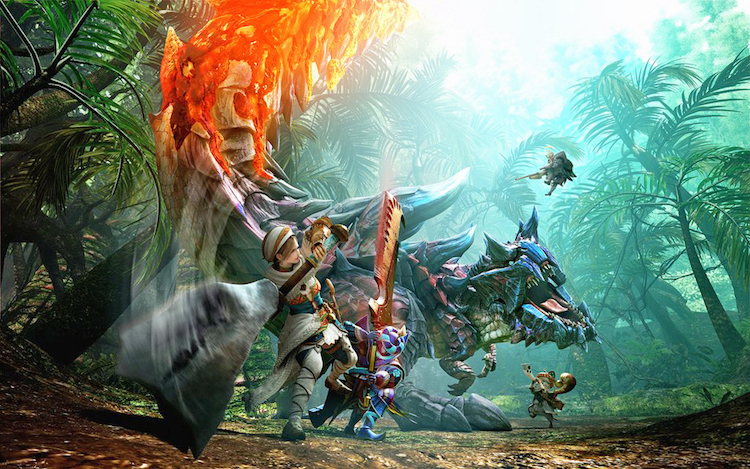 The latest installment of Capcom's Monster Hunter series has landed on Nintendo 3DS! This game features...uh, features...from various past installments in the franchise and combines them in a new adventure for players around the world. New Hunter-specific moves (called Arts) help you hunt and collect your prey, protect the land and make the world a much nicer (and safer) place to live! Play solo! Play together! Play online! Get out there and hunt some monsters! So, in reply to your previous question, YES, I will be up for playing online. I grabbed the game, waffled a bit about keeping it, tried the demo, and decided that I am TOTALLY on board! The new Weapon Arts are badass. I think Negative World would be more on board with this game if they could play it on their Wii U. That is assuredly true! I actually play my 3DS more than my home consoles these days, but even I'd rather have MH on a home console. I generally prefer pick-up-and-play games with simpler controls on portable devices. Negative World prefers playing games - any game - on consoles, it seems. Generally speaking. Most of the active handheld gamers that used to post here...don't anymore. LupinDS, Deerock69, TVandLust, etc. What happened to that crowd? I think I've gotten tired of this series, at least for now, which is why I'm not interested. I picked it up last week, and I've been familiarizing myself with it. This is my first MH game, and I haven't tried any online yet, but I am more than willing to! OK, I'm now 60+ hours into this game, and I'll say I'm hooked. I love playing with the hammer and smashing dragons in the face! Cool, good to hear that you're enjoying it. I was revving up, but I stalled after a bunch of guests came last month. I always think that I should experiment with different weapons, but there's something to be said for the comfort of an old, worn-in gunlance (or bowgun (or Great Sword)). Yikes. What's the next logical step, then? Great Sword? Yeah, that would be perfect. It's slower and more powerful, and you can still block. Just remember that rolling is essential with the slower weapons. You can immediately roll after any swing. And charged swings are super powerful. It's all about timing, timing, timing. I don't know what weapons are in this game, but I personally think Sword 'n Shield and the Great Sword are about as different as weapons get, so I find knowledge of using one doesn't carry over. I feel like the lance is closer to SnS even though it doesn't have the mobility, since the attacking is similarly simple and you pretty much just block everything. It also isn't a good idea to block with the Great Sword when possible as it tears through the weapon's sharpness quickly. If this game still has the Charge Blade, the sword part of it is also similarly used to the SnS, and then it can also morph into something similar to the Switch Axe which GameDadGrant said he liked. Again though, that's just how it is for me, everyone's play styles are different. I also don't know what, if anything, is different in this game. I can't seem to shake my love for the insect glaive. Upgrading it is the hardest part though. This game's presentation is more polished and some things have been improved over its predecessor. And the variety of levels is astounding, fun to see old levels updated. There's just too much to do! I finally opened up and got into this game. Are people here still playing it? I'm only HR 2 but I figure HR 3/4 will be a great time to jump online. Are you going to start doing Monster Hunter nights like we did for 3U and 4U? I'm personally planning to try and do everything in single player first. I'm increasingly finding that I enjoy playing Monster Hunter as a single player experience and that enjoyment is sadly greatly diminished if you already know what a monster can do from fighting it in multiplayer. @GameDadGrant Switch Axe + Evade Extender = Fun. Oh, Sword 'n Shield is Tried 'n True! Why do you think all the Knights of the Round did so? Or Link! Or Mikey!